Kushi-Ya has now opened permanently in Nottingham, reviewed here. I almost didn’t write about Kushi-Ya. Partly due to the fact that it’s only a popup but mostly because I found it hard enough to get a table even without much PR behind it. Kushi-Ya comes from the minds of two chefs from Iberico World Tapas who are flexing their creative muscles inspired by the cuisine of Japan. The majority of their cooking is with a Konro Grill, a traditional bit of kit that is essentially cooking over charcoals. Initially they had a series of supper clubs at Antenna, but more recently partnered up with Cottonmouth in Hockley which is where I managed to get a table. This isn’t a review of the bar as the venue will no doubt change but I liked the atmosphere and décor; sleek, dark and simple. We were whisked to a few tables that were on the second floor and started to take in the menu. Including a handful of snacks there were only around 15 options, modest but well formed. This also means you can try most things and don’t have the agony of difficult choices. We selected a couple of the most interesting snacks, crispy chicken skin with Szechwan pepper (£1.5) and crab and sisho rolls (£3). A relatively muted start in truth, the skin was not crispy enough (hopefully this isn’t going to come back to haunt me like Greg Wallace) and the pepper fairly absent. Nice enough as a salty accompaniment to an Asahi but I expected more. The rolls were technically stronger, neat and light but unfortunately lacking a little seasoning. I was unable to get the sweetness from the crab that usually makes it one of my favourite fruits of the sea. The more substantial dishes then began to arrive, Jerusalem Artichoke with miso mayo (£4.5) was more what I had been looking for. Crispy on the outside and fluffy in the middle with umami flavours enhanced by that rich mayonnaise. Half of the main dishes are skewered items and amongst vegetable and fish options the tofu (£3.5) and beef (£4.5) appealed to us the most. The tofu was katsu’ed (breadcrumbed) and served with a curry sauce that has become a ubiquitous sight across the country thanks to Wagamama. The white blocks were given a great texture with the crunchy outside and we scraped almost all the tasty sauce from the accompanying bowl. Beef skewers came with black garlic mustard. My god that mustard is good, one of the best condiments I have put to my lips. The beef was tender, juicy and flavourful too. It is similar to the beef onglet with truffle mustard at Iberico, a connection it isn’t hard to make given the backgrounds of the chefs here. 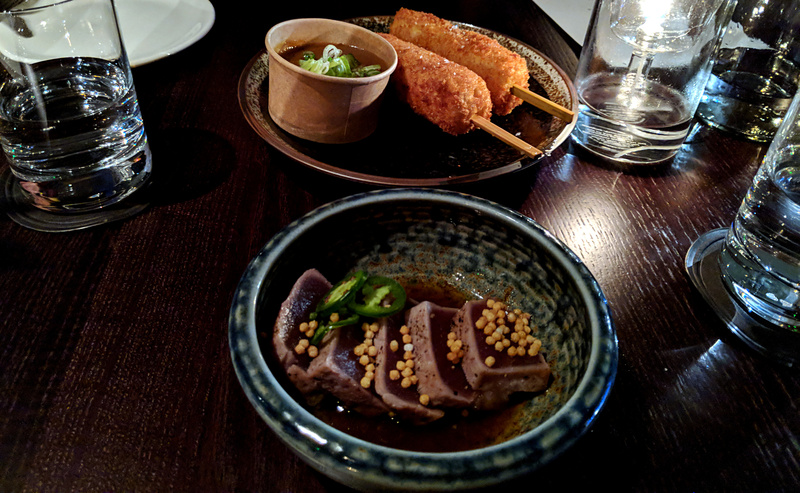 Finally on savoury food Tuna Tataki (chunkier than sashimi, £7) with Jalapeno ponzu. The fish was of high quality, nicely fatty and went perfectly with that combination of citrus and warmth from the chilli. I almost decided against a dessert. Tiramisu is one of my favourites usually so when I saw Tira’miso’ (£5.5) I thought it an affront to Italian traditions. I had to try it which made me realise that shouldn’t get in the way of progress. 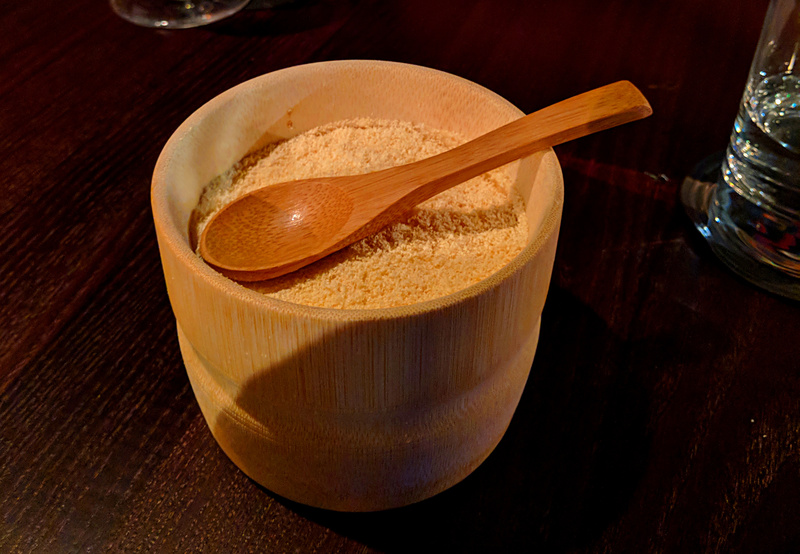 It was delightfully presented in a little wooden pot with a little wooden spoon, something different and I felt it make it more Japanese though I have very little basis for that! It was quite like a Tiramisu, a little lighter than most examples and the miso did come through strongly but it was a marriage made in heaven. A delicious, luxurious dessert that didn’t seem to heavy or rich. This quality of food would be impressive for an established restaurant, let alone a fairly new supper club. Most of all it is something different, yes there are a lot of Japanese restaurants but they all stick to the tried and tested menus that we all know. At Kushi-Ya there will be dishes and ingredients you have never heard of, mostly all employed to good effect. There are some serious bargains too like those skewers, all under £5. You might be wondering when you can go and enjoy their food. That’s a more tricky question, currently their next venue is unknown but I understand they are due to announce more nights so watch their social media with bated breath! If I find out myself I’ll update this…after I’ve booked a table.